Cover inks and colors: Erik Larsen, Reuben Rude & I.H.O.C. At the mausoleum lair, Raph and Mike are desperately trying to fend off Pimiko’s kunoichi forces with no help from the catatonic Leo, who is still surfing the Astral Plane. In an alley twenty blocks away, Leo attempts to continue his conversation with Don, whose fall from the helicopter has completely shattered his shell and left the Turtle paralyzed. Leo realizes that if Don is to be saved, he’ll have to return to his body and get help. Flying off into the Astral Plane, though, he gets lost due to his novice skills. Luckily, Splinter’s astral form appears and guides him back to his body before returning to his own. Splinter is still in Lord Komodo’s laboratory, being examined by scientists who determine that he’s a true anthropomorph. They report their findings to Komodo who is pleased and orders them to deliver Splinter to his chamber once he regains consciousness. Meanwhile, in the alley, Don wakes up to find a small rat sniffing around him. Paralyzed from the neck down, he scares the critter off by yelling, only to realize that it could actually be chewing on his toes right now and he wouldn’t even know it. Over at Lord Komodo’s palace, Splinter enters his bath chamber and is impressed by the many komodo dragons prowling around the joint. Komodo introduces himself as Warlord Go-Komodo, heir to the imperial Dragon Bushido, whose ancestors once ruled Japan (a position he seeks to reclaim). Splinter is honored to be in his presence, as he’d heard the Komodo lineage had been exterminated during World War I. Lord Komodo asks Splinter to prove his ninja skills by facing two of his elite samurai guard. Splinter effortlessly knocks them out. Lord Komodo apologizes for his disrespectful behavior and invites Splinter to tea. Splinter then relays the story of how he and the Turtles came to be (Hamato Yoshi, the Shredder, the ooze; you know the drill). Komodo asks if Splinter knows where the TCRI canister of ooze might be, but alas, Splitner knows not. Komodo then asks if there’s anything that would make Splinter more comfortable, and there is: a nice hot bath with two geisha. At the mausoleum lair, Raph tells Mikey to watch Leo’s back while he goes after Pimiko. Raph plows his way through to the leading lady, only to have her skill rival his own. But before Round Two can commence, Raph is forced to concede defeat, as Mikey has been felled by a half-dozen arrows to the shell and the unconscious Leo is being dragged off by the kunoichi. Precisely in the nick of time, however, Leo snaps out of it and fights off the kunoichi. The ninja girls escape into their helicopter and disappear into the sky, though Raph has a plan to follow them. Raph runs off and returns with a Triceraton aircar that Zog had begun construction on some while back (and Don had completed in his spare time). The three Turtles fly into the sky, but Leo orders them to forget about Pimiko and go collect Don. At Komodo’s laboratory, the Dragonlord is giving Splinter a tour. He shows him the cadavers of a number of anthropomorphs who failed to meet his standard. He explains that he wants to unlock the secret of the anthropomorphs so as to awaken the dragon spirit within himself. As the tour continues into the holding area, they discover that the carnivorous shark-man, Mako, has escaped from his cell. Mako knocks Komodo out and then informs Splinter of his intentions to eat their "host". In Manhattan, the Turtles finally reach the alley where Don is supposed to be. They find a pool of bloody metal, assuming it to be the remains of the cyborg that took the fall with him, but no Don. Eventually, they happen upon a skeleton inside a busted turtle shell and ponder what could have happened to their poor brother. *This story is continued from TMNT (Vol. 3) #2. The story will continue in TMNT (Vol. 3) #4. *The origin of Splinter and the Turtles was first presented in TMNT (Vol. 1) #1. *The Turtles befriended Zog in TMNT (Vol. 1) #19, though Zog met his end in TMNT (Vol. 1) #20. 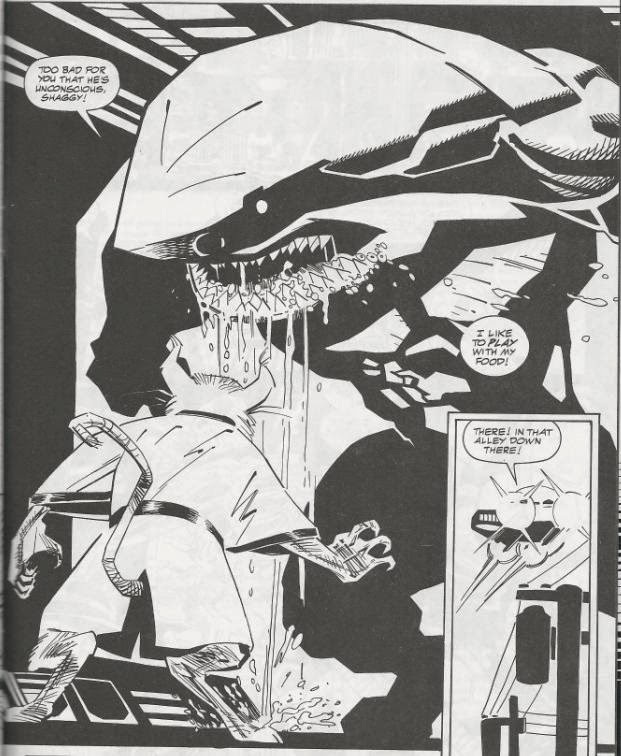 *Among the dead mutants and other oddities held in stasis tubes in Lord Komodo’s lab, are ones that bear resemblance to Batman, the Rhino (the one accused of being a man in a cybernetic suit) and Cerebus the Aardvark, whom the Turtles met in TMNT (Vol. 1) #8 and again in Miami Mice #4. After something of a rough start, the opening arc for Volume 3 as well as the overall plot elements are starting to come together. It’s nice to finally know just what’s up with Lord Komodo and why he’s so obsessed with furries, even if his backstory was relayed in a handful of vague sentences. It’s enough to satisfy my curiosities for now, anyway. Komodo’s a villain that takes a while to really build up into something other than a paper-thin overlord stereotype. He’s gettin’ there, though! I harped on this back in my review for TMNT (Vol. 3) #1, but I do take issue with Carlson’s overuse of humor. I don’t mind it most of the time; the Turtles not taking everything absolutely seriously. But there are moments when they should be a Hell of a lot more somber than they are, and finding the corpse of their brother in an alley is one of them. 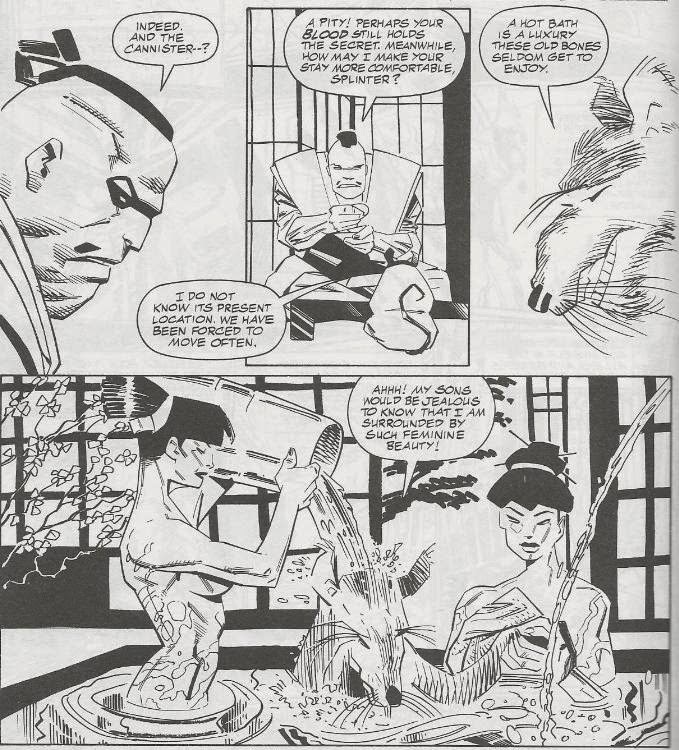 Splinter, too, shows little concern for the son that got shot in the gut by a laser and thrown out of a helicopter right in front of him, instead opting to take a bath with a bunch of geisha (albeit, a pretty funny scene). In many ways, Volume 3 is a relic of the 90s, prioritizing “badass” elements over emotional resonance, no matter how it seems to conflict with characterization. 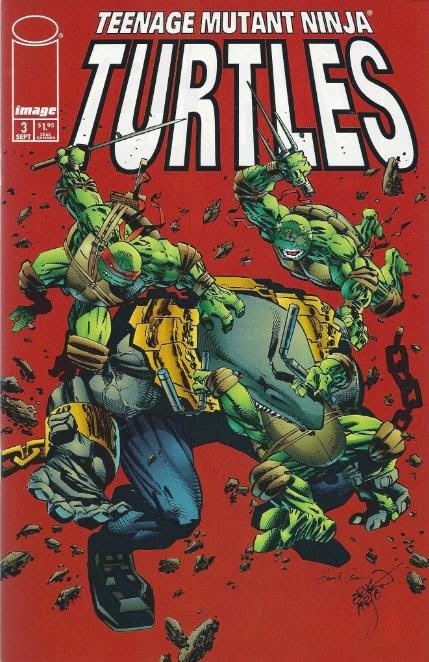 The Turtles’ almost comedic reactions to Donny’s apparent death being one of the most offensive elements of this run. It doesn’t ruin the whole storyline, which I absolutely enjoy, but it does taint the volume a bit. Still, there’s always Fosco. I love the way he draws Raph with Casey’s old mask on, to the point where it kind of bummed me out when Raph ditched it for the Shredder armor later on. 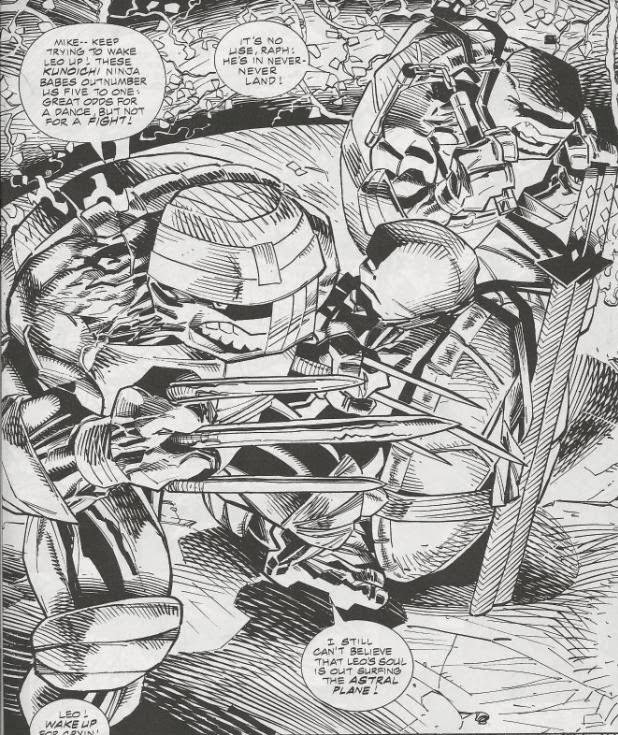 Though speaking of which, if I have one complaint about Fosco’s art, it’s that he completely fabricated the Shredder’s appearance in the origin flashback; his helmet looking more like scuba gear than the classic get-up we know so well. That’s really my only qualm, though, and it’s just a single panel, at that. At the moment, we’re still sort of slogging through the “rough” issues of the series, as Carlson is still trying to hit his stride with some mixed results in characterization along the way. These first few issues can be a little…irritating, but they’re worth it for the many entertaining plot threads they set up. Image was pretty bad about covers that had absolutely nothing to do with the actual issue or else they would give you a peek at the issue's cliffhanger. Wasn't Splinter the only one to battle Mako? Yeah, that's something I meant to bring up in my review. But I'll let it slide because this cover is absolutely *hilarious*. As a fan of the Dragon, I bought this issue because the cover featured Mako. It's probably what made me aware of TMNT comic-books !